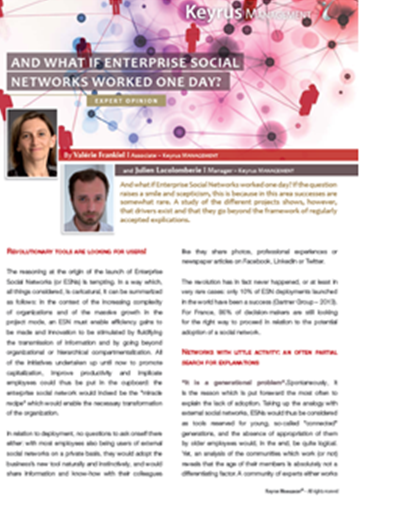 KEYRUS | And what if entreprise social networks worked one day? And what if entreprise social networks worked one day? And what if Enterprise Social Networks worked one day? If the question raises a smile and scepticism, this is because in this area successes are somewhat rare. A study of the different projects shows, however, that drivers exist and that they go beyond the framework of regularly accepted explications. Revolutionary tools are looking for users ! The reasoning at the origin of the launch of Enterprise Social Networks (or ESNs) is tempting. In a way which, all things considered, is caricatural, it can be summarized as follows : in the context of the increasing complexity of organizations and of the massive growth in the project mode, an ESN must enable efficiency gains to be made and innovation to be stimulated by fluidifying the transmission of information and by going beyond organizational or hierarchical compartmentalization. All of the initiatives undertaken up until now to promote capitalization, improve productivity and implicate employees could thus be put in the cupboard : the enterprise social network would indeed be the "miracle recipe" which would enable the necessary transformation of the organization. In relation to deployment, no questions to ask onself there either : with most employees also being users of external social networks on a private basis, they would adopt the business's new tool naturally and instinctively, and would share information and know-how with their colleagues like they share photos, professional experiences or newspaper articles on Facebook, LinkedIn or Twitter. The revolution has in fact never happened, or at least in very rare cases : only 10% of ESN deployments launched in the world have been a success (Gartner Group - 2013). For France, 86% of decision-makers are still looking for the right way to proceed in relation to the potential adoption of a social network.
" It is a generational problem ". Spontaneously, it is the reason which is put foreward the most often to explain the lack of adoption. Taking up the analogy with external social networks, ESNs would thus be considered as tools reserved for young, so-called "connected" generations, and the absence of appropriation of them by older employees would, in the end, be quite logical. Yet, an analysis of the communities which work (or not) reveals that the age of their members is absolutely not a differentiating factor. A community of experts either works very well, or not at all, and when adoption takes place it does not leave any generation by the wayside. Employees then appropriate this communication space for themselves as easily as they took to e-mail several years ago.
" We cultivate the art of confidentiality and of compartmentalization ". The weight of the organization, its history, the fact that it belongs to a "barony", local or otherwise, the wish to preserve its know-how or its information on its sector are all other reasons put forward by organizations to account for the failure of their ESN. Essentially, it is even stating the obvious : wanting to give a voice to employees who do not have the desire to have it, and without forcing them to do so, can but end in failure. But a closer study shows that the absence of appropriation is down more to an initial lack of collaborative culture, rather than a real cult of confidentiality. Enterprise Social Networks are not in essence "transforming" tools. They can accelerate a need for the transmission of information, but their success implies that collaboration reflexes already exist : already established informal networks, the use of channels (often with room for improvement) for the exchange of information, etc. The project mode, which is, by its essence, cross-cutting, can constitute an attractive point of entry for the implementation of internal social networks.
" The ESN brings nothing new to the users ". Behind this idea hides a key question : what is the (business) attraction for users on a daily basis ? Collaborative spaces which are not constituted around communities with cross-cutting interests are systematically failures. From this point of view, an ESN is not a gadget, and if users see no point in it and it does not facilitate their work, they will connect to the network once, out of curiosity, but then will not come back. In the same way, if the communities created replicate the organization existing within the business, it can be seen that they are just as much failures. Indeed, why bother exchanging messages with a colleague who is on the same floor as me ? What extra things are there to share on an ESN? Not all organizations are global and, depending on the nature of the activities, the needs for exchanges of information do not always justify putting a community in place on a social network. It is therefore essential to first consider what business communities are to be created, then to see to what extent they have a "truly" cross-cutting nature, such that the ESN may have its proper place.
" There are few contributors, and the ROI is therefore very limited ". The subject of the ROI of ESNs comes up in the same terms as for training. Applying a strictly financial model for the calculation of the ROI to a process which is collaborative, or which develops skills over time, is complex and bound from the start to fail. The plurality of the possible objectives (reducing the number of e-mails, the time spent in meetings, trips, facilitating integration, bringing employees closer together, sustaining skills, producing new ideas, etc.) makes it impossible to calculate an overall ROI. Although the metrics exist, they only enable the activity of a community to be measured. And one must also not forget the "90-9-1" rule established by Jakob Nielsen to categorize the types of users on social media : 1% contribute systematically, 9% occasionally, 90% never. Even in the last case, that does not mean that a piece of information which is published is not seen, read and assimilated by a user, even if he does not react to it. The monitoring metrics therefore make sense in a more qualitative measure. This dimension must be handled mainly by community managers, who are in a position to make the link with business issues and to measure the value created by the exchanges. Moreover, the tools are evolving in order to facilitate this analytical work, certain ESNs now taking on board semantic analysis tools enabling substantial flows of textual data to be organized. How can internal social networks be made into high added value tools ? Adopting a few sound practices which take into account the lessons learned during experiments in this area improves the chances of success of these initiatives by promoting the progressive adherence of users. Undertake, upstream of the project, a collaborative maturity diagnosis cutting across the whole organization, in order to identify existing communities to use as a base to launch the social network. Indeed, it appears that putting into place a community on the ESN is facilitated by the existence of a genuine working group, active outside of the network, or even existing before it. In this configuration, the ESN completes the palette of means of communication by offering possibilities for informal, daily and very operational exchanges. The collaborative maturity of an organization can notably be assessed through interviews and a specific benchmarking grid. First launch a few "pilot communities" amongst those working groups which are the most mature in collaborative terms. Such an approach enables experimentation and the identification of the sound practices to be implemented when the initiative is applied generally in the future. It is also an opportunity to formalize with the members of the pilot communities a use charter which will be disseminated once it is decided to generalize the network, whilst at the same time ensuring that it is Marketed to the rest of the organization via a simple "teasing" mechanism. The most enthusiastic members at this experimentation stage can even become the future ambassadors of the network and animate the first communities. Choose the tool which is best adapted to the objectives set for the ESN. Are we looking for an improved documentation base or a tool for relatively unstructured exchanges and microblogging ? Will photos and videos be shared or just text documents ? Will the network be a vector for innovation or training ? Will it integrate itself into the organization's business applications (for example with a CRM) ? Being clear on the ESN's objectives will enable the best choice to be made in terms of technology, most of the tools on the market having particular characteristics and catering to a greater or lesser extent to each of these cases. Measure and follow the activity of the communities, in order to publicize successes, identify potential additional needs in terms of facilitation and, above all, be able to put swiftly in motion steps to capitalize on the content exchanged which will complete the anchoring of the internal social network as an essential element of the organization. Applying these few sound practices enables the chances of success of an ESN initiative to be maximized. However, they do not enable it to be guaranteed, firstly because the use of such a tool cannot be made obligatory without contradicting the collaborative logic that one is trying to put in place, but also because an ESN inserts itself into an environment which can be more or less conducive to it : scale of the collaborative culture, of the geographical remoteness and of the needs of its members for exchanges...The risk that the ESN may not always find its users thus remains present on this type of project, which is not a bad thing in itself, learning by mistakes being, when all is said and done, one of the major dimensions of the 2.0 culture. Finally, an internal social network is, at the end of the day, merely a means of reinforcing a culture of collaboration and of sharing which is already well entrenched, or of facilitating its emergence. It is therefore just one of the pillars of a culture which cannot be decreed. It is thus more reasonable to attach to it objectives and an ambition adapted to it and under no circumstances to seek to make it THE driver for the collaborative transformation of organizations.